Personnel contact details for the various brigades and Volunteer Fire & Rescue Service are available by clicking here. Festive season automatic harvest bans: 25th & 26th of December and 1st of January each year. For more information on 'Bushfire & Smoke Alerts' please consult the Department of Parks and Wildlife. Their info on 'Prescribed Burns' is available here. If you'd like to get an SMS each time a ban is imposed in the Shire of Williams, contact us to be put on the list. You will also be notified of any variation to the restricted/prohibited burning periods. You need to do this only once, and will remain on the list until we receive your request to be removed. To request removal from our SMS list, simply 'Reply' to one of the SMSs with the word 'Unsubscribe'. Unless unsubscribing, please do not reply to a harvest ban SMS with a message of your own, as these are be monitored. There is also a Harvest Ban Hotline on 9885 1588, where a recorded message will inform you of the current status relating to Harvest/Vehicle Movement Bans. If you will be operating private equipment at fires you are required to apply for a Fire Response Vehicle Identifier sticker. Application forms are available at the Shire Office or by clicking here . This application does not incur any fees. 1. Citation This local law may be cited as the Shire of Williams Firebreaks Local Law 2007 and Firebreaks Amendment Local Law 2008. 2. Commencement This local law will come into operation on the fourteenth day after the day on which it is published in the Government Gazette. 3. Repeal The Shire of Williams Local Laws relating to Firebreaks published in the Government Gazette on 24 October 1997 and the Shire of Williams Firebreaks Amendment Local Laws 2001 published in the Government Gazette on 8 February 2002 are repealed. 4. Interpretation In this local law unless the context otherwise requires  “building protection zone” means a low fuel area immediately surrounding a habitable building and is designed to minimise the likelihood of flame contact with other buildings, and must fulfil the following conditions: (i) bush fire fuels must be maintained below 10 centimetres in height; (ii) trees and branches that may fall onto a house must be removed; and (iii) lower branches of the remaining trees must be trimmed; “district” means the whole local government area of the Shire of Williams; “firebreak” means ground from which flammable material is to be removed and on which no flammable material is permitted during the firebreak period; “firebreak period” means the period from 5th day of November to the 12th day of April in the following year within the district; “flammable material” means dead grass and timber, boxes, cartons, paper and any combustible material or rubbish, but does not include green standing trees, growing bushes and plants in gardens or lawns; “townsite land” means all the land within the boundaries of townsites in the district; and “rural land” means all the land not defined as townsites within the district. 5. 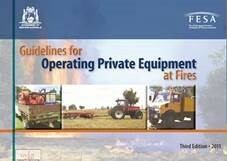 Provision of firebreaks All owners or occupiers of land within the district shall have firebreaks during the firebreak period of the dimensions prescribed in this local law. 6. Rural land (1) During the conduct of any harvesting/straw baling operations, stone raking and slashing activities, an operational independent fire fighting unit containing not less than 750 litres of water with a motorised pump and at least 15 metres of 19 millimetres diameter hose is to be provided in the same paddock or within 50 metres of that paddock. (2) All flammable material is to be removed from around buildings and stacks in hay and straw processing plants to a width of 20 metres. 7. Townsite land (1) Where the area of land is 2,024 square metres (or half an acre) or less, all flammable material is to be removed except living standing trees. (2) Where the area of land exceeds 2,024 square metres (or half an acre), all flammable material likely to be conductive to an outbreak, spread or extension of fire is to be removed, and the grass is to be maintained to a height no greater than 10 centimetres. (3) All flammable material is to be removed from around buildings, fuel dumps and liquid fuel containers to a width of 20 metres. (4) All habitable buildings are to include a building protection zone of 20 metres in width. 8. Non compliance Failure to comply with this local law shall be an offence and shall subject the offender to the penalties prescribed in the Bush Fires Act 1954. Everyone is encouraged to visit http://www.areyouready.wa.gov.au/ and share the information with neighbours and family to make sure everyone in the community is well prepared for the coming bushfire season. Developed with tips and advice for communities across the state, this site includes a guide on the steps everyone can take to make sure people and homes are the safest they can be in the event of a fire. There are also fact sheets and checklists for easy reference. The website is easy to navigate with a user-friendly, clear layout so do yourself a favour and check it out today! Click here for the 2017/18 Fire Newsletter. Click here for a Get Ready reference sheet.